This agreement is for the sale of rights in music or choreographic work. It could be used by either the buyer or the seller. It covers protection for both in reasonable balance. Of course, you may edit out any paragraph that you think may overly favour your counter party. 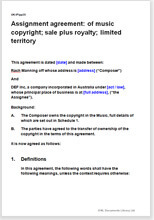 The agreement preserves the composer’s or originator’s rights to sell the same composition in different markets by limiting the extent of rights sold in this deal. You can restrict what is being sold by reference to use, publication, time, country, language, medium, or as you decide. It preserves moral rights as composer. If the seller wishes to retain the right to buy back the work in preference to anyone else, if the buyer decides to sell it in the future, then this agreement is more suitable. If retained rights are complicated, it may be better to license use rather than assign ownership rights. In this situation, our licence of music would be more suitable. In addition, there are over 1,650 words of drafting notes to help you edit the document to your precise requirements.